The blend of herbs is the traditional recipe of the Wat Po temple in Bangkok. Manufactured in Chaing Mai, they are certified by the government as authentic. This special blend of herbs helps nourish, revitalize, texture and tone the skin. Our recipe and treatments are sure to start your clients on their journey to paradise. Most appropriate steamer we have found for the herbal balls. 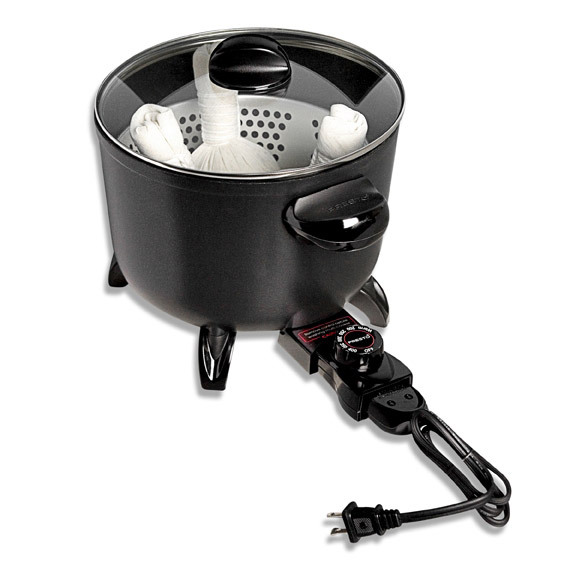 Provides good steam while allowing for excellent temperature control. Starter Kit - Start on your way to the "Journey to Paradise"
This instructional DVD features a comprehensive, hands-on, step-by-step approach of the safety, techniques and two facial protocols for Thai Herbal Ball facials. Indexing allows easy access to treatments and navigating throughout the entire DVD! After review of this DVD, you will be well on your way in helping others on a journey to paradise! Promote your new, unique treatments to your clients.